I have always dabbled in the arts and crafts, as a way of self expression. I never thought that one day it would be my chosen profession. It started with making gifts for my family and friends, then into some painting/drawing lessons. But I still had not found my medium. At 14 I discovered a crochet needle, and the endless possibilities of yarn. In 2010 I had my first child, and in 2011 I had my second. With Autism (PDD-NOS) and papillary thyroid cancer playing a role in our family's life, it only seemed natural for me to be a stay at home mother. But what could I do to keep my mind and my hands busy? Through The Knit Tree, with lessons on most of the products, I rediscovered my passion for yarn, my imagination took over, and now, I welcome you to: The Crochet Critter's Corner along with my expressions of art in hand painting on knit fibers. Knit Cotton visor Cap with a Rayon chenille and cotton scarf hand painted with the autism heart puzzle. Mothers get inspiration from their children. With two non verbal autistic daughters, Dani's days are filled with Early Intervention autism therapies including Parent Infant Program, speech, occupational and group therapies. To keep her creative juices flowing, she enjoys hand painting these special Autism Heart Puzzle Scarves as a way to promote Autism Awareness, Early Intervention and to help earn an income from her home business. The autism puzzle is seen with many interpretations of meaning. Dani has painted the puzzle pieces within the shape of a heart to symbolize all the love, patience, and understanding needed for each autistic child / person. Autism in itself is like puzzle pieces, not one case is similar to another and each is beautiful in its own way. The heart with the missing white puzzle piece and the scrambled words “Each Piece is Unique” represents the differences in how the autistic child / person processes the world around them. Some are non verbal and have the frustrations of communicating. 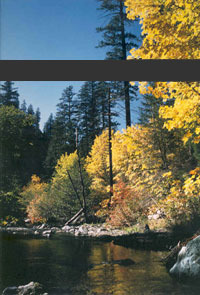 Some have sensory issues which may include feeding problems. Some are just seen as eccentric. Each is unique in their own way. The second heart puzzle shows all the pieces coming together. Through early intervention and appropriate treatments, people with autism will lead fuller, and more complete lives. Like a puzzle, the pieces of autism fit together and create a beautiful and rewarding picture that has the possibility to teach a lesson, and make a difference. 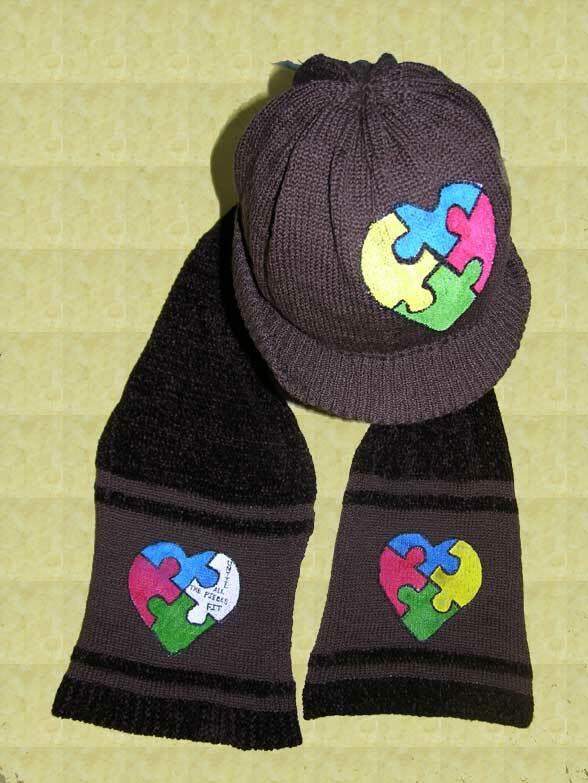 Go to our online store in the One of A Kind Unique Scarves category to purchase this Autism Awareness knit heart puzzle scarf and support Autism Awareness. If this scarf is already gone, check back, more will be on the way! 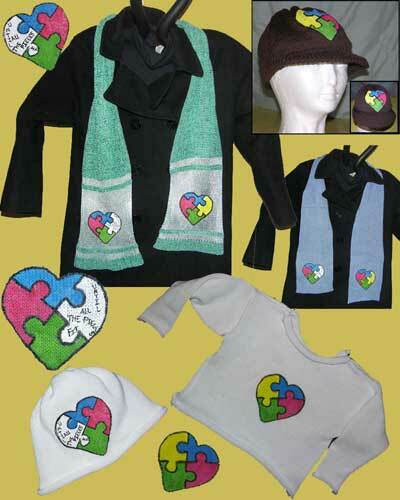 Autism heart baby clothes are found in the one of a kind Knits for Babies and Toddlers category of The Knit Tree's online catalog. Our Autism Puzzle Heart Knits deserved as special category all of their own. 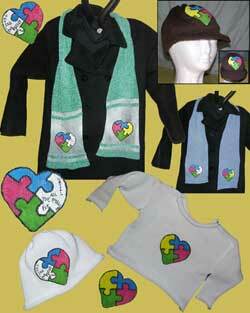 Go to the Autism Heart Puzzle Knits category to find all the knits in one place. A Touch of Understanding (ATOU) provides disability awareness programs designed to educate a new generation to understand the challenges associated with disabilities and to accept and respect all individuals. We’re a nonprofit organization comprised of dedicated individuals, some with disabilities and some without, who come together to form a strong team working to help students look beyond the disability, the wheelchair, the braces, the unpredictable behavior and see the person. Whimsical crochet hat with a bow in sizes baby thru adult. Danielle started crocheting as a young teenager. 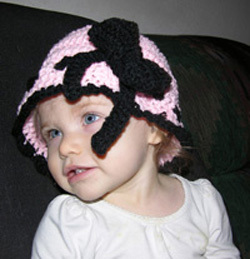 Now she gets requests for a special critter to be crocheted in a cap in all different sizes. When the girls are sleeping and she gets a chance to watch TV with her husband, her hands are still not idle. Out comes the crochet hook and yarn and another Crochet Critter hat is added to the collection. 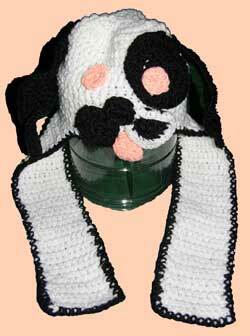 Some of the hats get an attached crochet scarf which can vary in length according to the size. Go to our online store in the Crochet Corner to purchase one of these special Critter hats or other crochet items as they become available. These are one of a kind so if you don't see one in your size "Contact Us" at customer service. 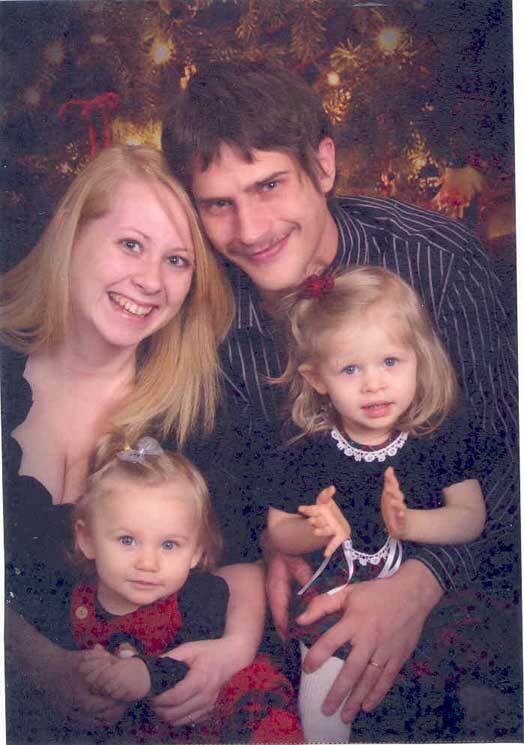 Danielle and her family appreciate your support of her home Cottage Industry! Danielle and her family appreciate your support of her home Cottage Industry. Danielle is a young artisan in the prime of her special career. She and her family have alot of challenges ahead of them and meet them with the attitude of 'we'll all work together to make the best life possible for all the members of our little family'. The creative processes involved in the knitting, hand painting and crocheting give Dani an avenue to express herself and help in this endeavor. You can contact Danille through customer service by clicking on this link contact us to find out if special order is something she can put in her schedule of events. Crochet Critter, Danielle Nani, not only enjoys the knitting, crocheting, and hand painting, she encourages other little knitters by helping them learn the crafts as well. Dani is very involved in supporting Autism Awareness and Acceptance as well as Cancer Awareness. Therefore, The Knit Tree has added a Blog to our site so she has an avenue to share stories, tips, resources, challenges of balancing the caring for her two autistic daughters with her own physical and mental needs and a home business.